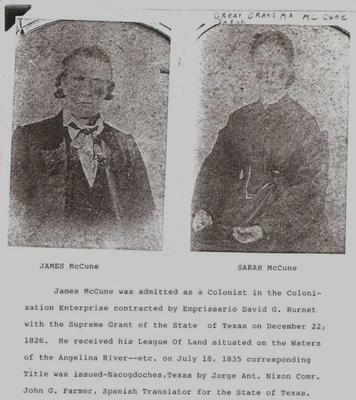 James McCune came to America with his two brothers. He is known in Texas as "James the Pioneer" as, in Texas, he received 10 Land Grants from the Spanish Government before Texas was even part of Mexico. Each land grant was for a league of land (4,200 acres). Forty McCune families still live on McCune land in East Texas. I have set up a Face Book page for the "James McCune Family". I would love to hear from all of my blood (as we say in Texas). I always assumed I would see your land but I can no longer travel so take pictures and post them so I may be with you in my heart. C.
Comments for McEwan..McCune in American! I moved this submission from Clan McEwen Stories. We have pages on Clan McEwen stories and on Finding other McEwans. I even carved out Cousin Jim's research, and there are comments there too... to see all the stories and comments, you need to check all of them. Sometimes people find one page or the other... I do attempt from time to time to organize your submissions by moving some of them where they might be more help to others. Hope I don't end up confusing the issue... and I hope you all can find your relatives. Join in and write your own page! It's easy to do. How? Simply click here to return to Find Other McEwans.